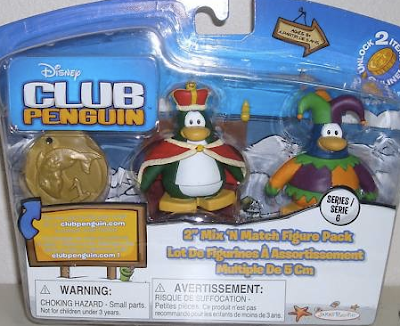 Club Penguin Cheats by Mimo777 Club Penguin Cheats by Mimo777: Club Penguin Series 6 Mix & Match Toys and Treasure Book UPDATE! 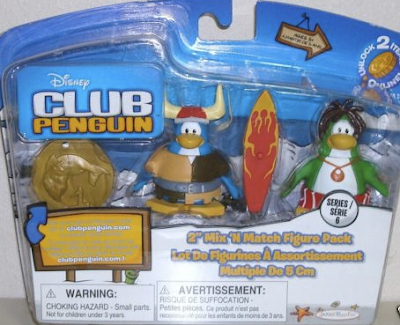 Club Penguin Series 6 Mix & Match Toys and Treasure Book UPDATE! 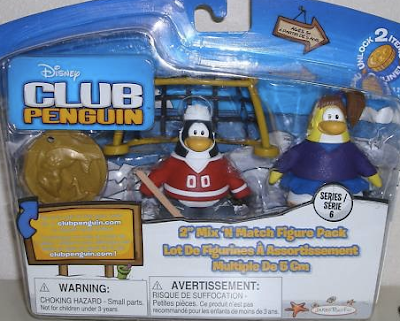 You can check out these and all Club Penguin Toys here. The Treasure Book doesn't really have too many cheats in it, but here they are. 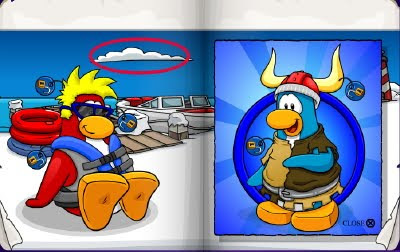 On page 2 click on the cloud and you will get the Viking costume. If you click the dragon's tail behind the pillar on page 5, you can get the dragons costume. Whoa! Check out page 7! Weird! What could that question mark mean? Now we know! My good friend Fluffygood told me that if you enter a Series 6 Coin Code you can unlock these items! There are rumors that you have to enter 5 items. Dunno. hey mimo i have a cheat: on the merry christmas postcard on clubpenguin if you click on the lights or the dark green penguin the lights turn on! Wow, those toy are awesome! cool i like the cadence,boombox and disco floor! Cool post mimo but do you have the "2 mix 'n match figures ALREADY? Ps. sorry about all my comments! Coolio! I must buy them! you forgot the Herbert P. Bear mix n' match! it's pretty cool! STOKED!!! I'M TOTALLY FREAKIN' OUT!!! I WANT CADENCE BAD!!!! P.S. I'm having a party on Christmas Day to celebrate x-mas and my penguin turning 700 days old! I'll announce the time and room l8r. What! Series 6? Treasure Book? This is COOL! I think new treasure book will be released after Christmas Party! Also it's my birtday on 22nd of December! Waiting for your ''Happy Birthday'' :D By commenting or by tweeting! this is so cool i like the viking and the surfer iswell i'm getting it for christmas yayyyyyy!!!!! Nice Mimo, cant wait for them to come out! I got every well know penguin like Rockhopper, Gary, Aunt Arctic, Sensei... all i need is Cadence, she looks well cool! Series 5 are out but only in the USA cause they havnt been shiped to the UK and places but yea, i get what you mean... i fell like series 5 just came out too. Thnx for sharing, ill check it out! Iglo20 said: hey mimo i have a cheat:on the merry christmas postcard if you click on the lights or dark green penguin the lights turns on! Hey Mimo, I found a cool glitch! Sometimes, when a message pops up when you're leaving a room, the message will stay there! Do you buy all these toys? Cool! I have a question. Can you get items from only the most recent Treasure Book, or can you get items from old Treasure Books, too? Mimo won't reply, but I can! Just answer questions, like I am doing. For official rules check mimo's sidebar, there's a link to the rules. I love the candence oNE! I love Viking and Surfer dude too. I keep track, Americans have such better stuff then us. And they don't send us things like this much probably cause they think no one plays on it in UK. But they do, lot's of us, loads of us in school! :(:(:( Look guys all of you live in USA and some of you have got loads others have not I mean be lucky! In UK we don't get these, well I don't hear people talking about em here! Sorry but never in my whole life have I seen Mimo reply to a comment, but I can help you. All you do is copy then paste the comment you are answering then put your name (CPG Mod) after it then you're ready to go. Check more detailed rules above the mod list. I think the old ones too. the question mark means that when you unlock an item super exclusives come. 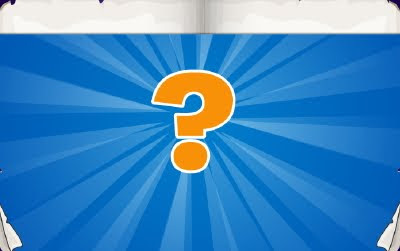 the page with the question mark is the super exclusives page. 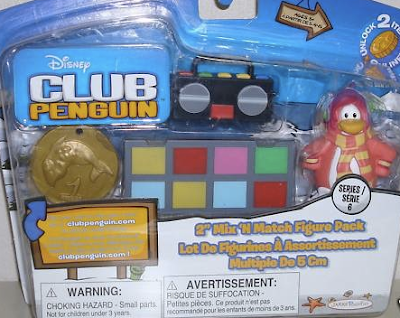 you can unlock it by entering teh 5th series 6 toy codes. Probably. Toys R Us are selling them. I saw them their but forgot money. ;) I was so bummed out. This following info was not founded by me, CPBrowsers should get all the credit. I have a question what is the tresure book and where do u find it also what is a mod plz plz plz answer mimo.And if u see some one called sallycarally a cp plz ask her to be ur buddy i thnk u rock! No, I'm pretty sure he got the pix from CP or somewhere else... but he could've seen them already and took pictures! OK, GUYS, ALL OF YOU L@@K AT THIS! MO I'M USING CAPS CUZ I WANT PEOPLE TO LOOK. ALL YOU ANONYMOUS PEEPS, DON'T LABEL YOURSELF AS ANONYMOUS; MIMO DOESN'T KNOW WHO YOU ARE, AND YOU CAN JUST PUT YOUR NAME IN Name/URL INSTEAD OF BEING ANONYMOUS; URL IS OPTIONAL, YOU CAN JUST PUT YOUR NAME, TOO, YOUR CP NAME, AND PEOPLE'LL KNOW WHO YOU ARE. YOU DONT HAVE TO BE ANONYMOUS! I USED TO BE ANONYMOUS, BUT NOW I STOPPED CUZ I REALIZED I COULD USE Name/URL INSTEAD OF BEING ANONYMOUS! GOOD LUCK, GUYS! mimo if u click w when ur wearing the tree costume it lights up! 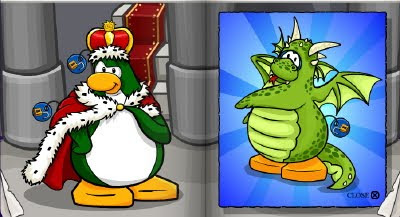 o_o CP added new server called BELOW ZERO! Check it out! CP added a new server called: Permafrost! Lolz. Most Targets don't sell them, try Toys R Us. By the way, happy early b-day Safa! Yo Mimo!I'm new here. If u unlock things do u still have to buy them? If I'm a member, when my membership expires do I still get to keep the things i bought? Can you please make me a CPG mod? ~Proooom (CPG MOD) i hope i can be a mod and so you be. Mimo, there also a Herbert and Klutcly drill one. Nice one! I didn't know about that. I'll use Name/URL for now on. awesome mimo! but... y hasnt teh 5 toys come out yet? Thats weird! I will myabe get there for christmas soon. 10 days till christmas! are you excited mimo? The series 5 toys are out. I saw them at toy's r us. 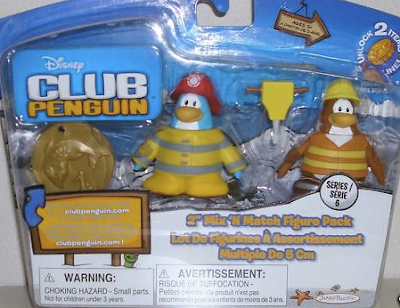 I thought the series 6 toys were already out. I can't wait for x mas! I was just about to talk to Sensei in Fire Dojo when I smiley face appeared in the bottom right of my screen, I maniged to talk to him but every time I went somewhere It goes in exactly the same place everywhere I go! I know it's a glitch but it's freaky! I don't like it! You know I said about that smiley face glitch, well it went away, I went into a different room but someone was saying "ull miss me" Its freaky, the smiley face takes over anything when it's gone! Just have to say thanks to Buddytoe and TulipPearl1 for answering my question. Thanks! how do u put in 5 codes at once? Well Mimo won't reply to the comments. But a mod is short for moderator, they answer questions on this website and put (CPG Mod)after you answer a question. Since you're new here I'll answer very detailed answers. When your membership expires your items will still be there but you can't use them, wear them etc. Mimo can't just make you a mod you have to answer questions. Check more details on the top of the mod list which is on the right sidebar near the bottom. Thanks Mimo for giving me credit. You made my day. thanks!i never knew that.i was always a anonymous. i have a question: when u enter a coin code, there will be clothes 4 u 2 unlock. but, are these clothes only 4 members? I emailed CP support and they said you need to unlock 4 or more codes from ANY combination of treasure books for the exclusive page. I just entered my code and I got the super exclusive items! I think after you enter 5 codes (they don't have to be from series 6)you get that message so that you can get the super exclusive items AND 2 extra items! I entered my puffle code which usually unlocks 2 items. But then I got that message and then I could unlock 4 items! how do you get four items on the treasure book??? (series 6)?? That is if you enter 5 codes then you get 2 extra items. My mom said she would by them all for me!!!! So, I will comment to you when I get them. 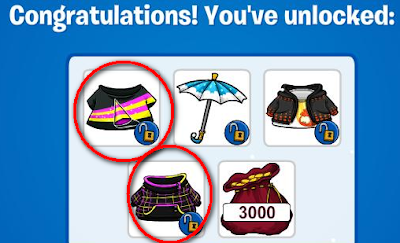 you dont need to be a member to unlock the clothes so non members can pretend to be members! hey mimo777 missy i have a blog likeyour but i dont no how to get the word out how did u??? Disney has dona a MIRACLE to club penguin!Go DISNEY!! !And I'm one of the people that don't say Disney made CP worse!